The Bengali Culinary art has always inspired my cooking. Say it like fish, chicken or any vegetable i often like to cook it the Bong way. This time it was chicken curry that i prepared. As i mentioned earlier a bong dish often has a dash of sugar to it for carmelizing the dish. I used the same principle in this curry too. The output of this recipe is superb. My husband was extremely happy with texture ,taste and flavor. While i was cooking the aroma was tantalizing. I am sure the readers of this post will find it extremely helpful to prepare chicken curry the bong way. Marinade the chicken with turmeric and 1 Tbsp of oil. Leave aside for 10 minutes. Heat 2 Tbsp of oil in a pan. Add the sugar and let it dissolve. Add the mentioned whole spices(Cinnamon , cardamom, bay leaf and cloves). Wait till you can smell the aroma. Next add the onions and green chillies. Saute until onion Turns transparent in colour . Now add the marinated chicken . Cook at high heat since lots of water will be released. Fry until chiken is 25% cooked, i.e. the color of chicken changes to little whitish. Now add the salt and ginger garlic paste. Saute till the raw smell of ginger garlic paste is over. Now prepare a masala paste by adding little water to the mentioned remaining spice powders. Add this spice paste to the chicken. Also add the tomatoes. Fry until oil oozes out and the tomatoes are done. Check for salt at this point of time. Adjust salt and then finally add water. Let this simmer in medium to high heat until you can see the gravy of desired consistency. Finally turn off the heat and garnish with coriander leaves. Your chicken curry is ready to be served, Serve it hot with Rice, Chapati or Nan. This is the ultimate treat and a wonderful chicken curry recipe. Gosh!! I just love it, that spicy taste especially being my fav. Gonna try this for myself because my other half doesn't eat chicken. Not sure about the kashmiri chili and whether its available over here. Will try to look for it, if extra of chili powder I think should be ok. The chicken curry looks lovely sush! I have just started following your blog & you have a lovely space. Thatx so much dear for dropping by my blog always & leaving a lovely comment. Nice one Sush, I'm sure your hubby enjoyed it. Don't the bongs use mustard a lot too in their dishes? I was looking for sugar in this chicken curry. 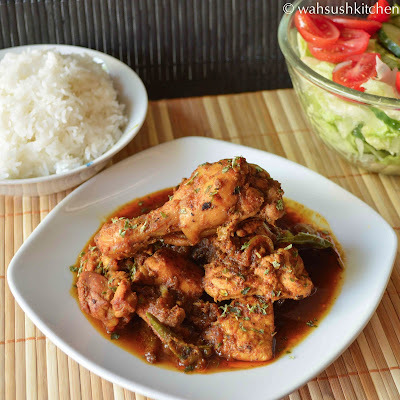 Yummy Bengali style chicken . Yummy looking tempting curry..nice clicks. Tempting gravy ! looks amazing...great clicks ! I love chicken curry and your dish look scrumptious! I can see why your hubby loves this so much. Can't wait to give this a try. yummy yummy dish, dear..sure it went great with the white rice. thats a nice bong chicken ! I made this chicken dish last night, along with your recipe for chaptis and both were very, very good! I wasn't sure what a kashmiri chili was, so I just added some regular chili powder. Thanks for the recipes! Wow, I want to use and I wanted to buy online this one but I am not sure where can I buy the cheap and original one. This is really beautiful post for what I was looking for. I would also like to Thank you for sharing and I wont miss your next post. I am a great fan of Whitening creams and wanna try always. I would Like to ask you and : Is it Okay to use for Pregnant Women and What age of skin type should use or any Good recommendations please. Copyright@wahsushkitchen. Simple theme. Powered by Blogger.